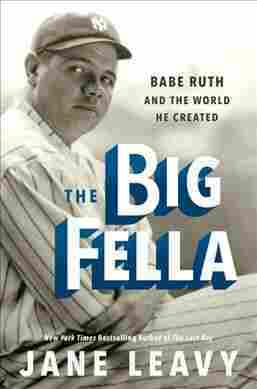 'The Big Fella' Highlights Babe Ruth's Spot As First Celebrity Sports Star Jane Leavy tells the story of Ruth as the first baseball superstar — but also of his roles as movie star, vaudeville performer, barnstormer, pitchman for every conceivable product, and columnist. As the New York Yankees prepared to play the Boston Red Sox in the first round of this year's playoffs, the staff at Gate of Heaven Cemetery in Hawthorne, N.Y., braced for cleanup duty. The grave in Section 25, Lot 1115, gets plenty of traffic. But the playoffs are always extra busy and, as The New York Times reported, a Yankees-Red Sox playoff series sends the visits to George Herman Ruth's grave into overdrive. And standing at Babe Ruth's grave apparently isn't enough — people feel compelled to leave not just bats, hats, balls and gloves but also a lot of alcohol and food. "People leave them all the time — a hot dog in a bun," the cemetery superintendent told the Times. At the modern peak of the Yankees-Sox rivalry, the 2004 American League Championship Series, someone delivered a pizza to Ruth's grave. Why does a baseball player who retired 83 years ago and died 70 years ago inspire such a personal connection in 2018? Because, as Jane Leavy details in her new biography, The Big Fella, Ruth wasn't just the first baseball superstar. He was also a movie star, a vaudeville performer, a barnstormer, a pitchman for every conceivable product, and a nationally syndicated newspaper columnist. He was the first celebrity of the mass media era. Early in the book, Leavy rattles off 58 different nicknames Ruth went by. There are the usuals, of course: the Babe, the Bambino, the Sultan of Swat. There's also the Bizoo of Bang, the Mastodomic Mauler and — my new favorite — the Swattingist Swatter of Swatdom. But as global an icon as Ruth was and remains, he is also a one-dimensional figure. Just like early American icons such as George Washington and Abraham Lincoln, most people know only a couple of real facts about Ruth's life — and those facts are very likely oversimplified or outright untrue. All that is accurate — and covered by Leavy — but what's missing is the human element. Leavy documents a personal life marked by tragedy: Four siblings died as children; Ruth's parents effectively abandoned him to an orphanage at age 7; and Ruth's first, estranged, wife died in a fire, among other hardships. But Leavy doesn't write about how these terrible moments shaped Ruth's personality and life, because it's simply unknown. Ruth never really told anyone, and the hagiographic sports reporting of his era never delved into it. That makes it hard to write a thorough biography like Leavy's last book, The Last Boy, which was centered on moments of Mickey Mantle's flawed humanity and vulnerability. Leavy responds by doing the next best thing: painstakingly re-creating the mythical, larger-than-life role Ruth played in American culture at the height of his fame. She does this by framing the book around a national barnstorming tour Ruth and Lou Gehrig took at the absolute peak of Ruth's powers: the weeks immediately following the 1927 baseball season. Ruth had hit an astonishing 60 home runs that year, then led what is widely considered to be the greatest baseball team of all time (with apologies to the 1998 Yankees) to a World Series title. After that, Ruth and Gehrig hit the road on a publicity tour orchestrated by Ruth's publicist and manager, Christy Walsh. They traveled by train from New Jersey to Missouri to Colorado to California, pulling into small towns to wow crowds with exhibition baseball games against local teams. Each stop was a whirlwind, and so, at times, is the format of the book. Using headlines from the tour as jumping-off points, Leavy skips from year to year, elliptically covering the rest of Ruth's life and career. For example, after describing a photograph Ruth took with a record-setting Nebraska chicken — the Babe Ruth of egg-laying! — Leavy details how Ruth and Walsh pioneered product endorsements and publicity campaigns. The structure takes some getting used to, but it perfectly captures the swirl of attention that followed Ruth everywhere he went. Most of the exhibition games were delayed or ended early when children rushed onto the field to touch or be near Ruth. Glancing encounters Ruth had with people along the way — a drive to the train station, a dinner at someone's house, even just a quick picture or meet-and-greet — became defining moments in their lives. Photographs, autographed baseballs, and scorecards from the exhibition games became family heirlooms, or auction items later sold for tens of thousands of dollars. That's not how life was when Ruth was playing. He was the first mass media celebrity, sure, but radio broadcasts were still rare in 1927, and no team played west of St. Louis. For all the people in the Midwest and Western towns that Ruth and Gehrig rolled through that fall were concerned, the two men were Olympian gods whose exploits they could only read about in delayed wire reports. But here they were, shaking hands, hitting home run balls, then waving as they rode out of town on the train! The scenes of these encounters — especially the amazed and breathless local newspaper articles Leavy liberally quotes — captures the beginning of the shift from faraway, mythical figures to modern media celebrities. When you read how people spent the rest of their lives telling everyone who would listen how they once watched Babe Ruth, or how he once patted their heads as they worked as the bat boys for his team, you might understand how, half a century later, someone could feel compelled to send a pizza delivery to the Hall of Famer's gravesite.